The theme for this week’s I Heart Cooking Clubs is therapy and comfort food. Ruth cooked her way out of emotionally hard times, so we were tasked to make a Ruth Reichl dish that we find therapeutic—either in the cooking or the eating of it. It’s the busy holiday season so please forgive me this transgression. 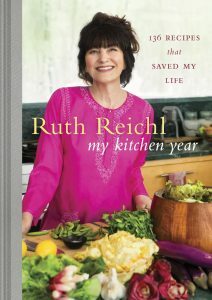 Today I am recycling a post from 2017 when I reviewed Ruth Reichl’s latest cookbook, My Kitchen Year: 136 Recipes That Saved My Life (September 2015). For my original post and review, click here. My Kitchen Year: 136 Recipes That Saved My Life deals with the unexpected demise of Gourmet and how Reichl found herself unemployed and drifting. 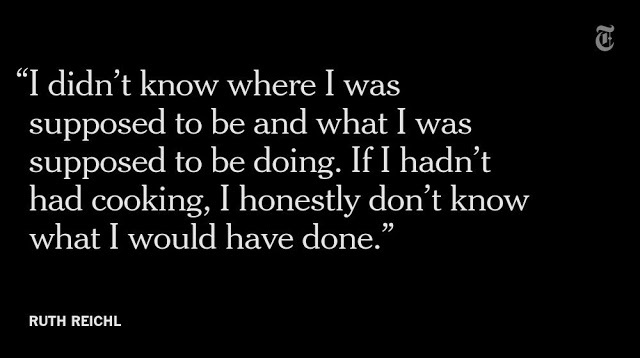 That she felt a little unmoored is an understatement. I felt like I was having coffee with her. Pasta is a true comfort food for me, it matters not if it is doused in marinara, alfredo, or cheese. It makes me happy and brings me comfort (and perhaps a little therapy as I am whipping it up). I’ve taken a few liberties with the ingredients, but Reichl maintains that you need to seek out the very best mozzarella di bufala and olive oil. Place olive oil in a large serving bowl. Slice the garlic and shred a handful of basil leaves into it. Cut the tomatoes in half. Add to the olive oil mixture and let set at room temperature for an hour. Cook the spaghetti according to directions. When it’s al dente, drain and toss it with the olive oil mixture in the serving bowl. Add cheese and toss until its melted. Salt and pepper to taste. The technique of letting the basil and garlic and tomatoes settle in together for an hour before tossing with the pasta is genius. So much flavor! This is a versatile dish and in my opinion it’s certainly more than servings for three. (Four or five in our household.) I am sure that if I could have found real mozzarella di bufala this would have been more delicious. We did enjoy it but I might use goat cheese next time. I like the bruschetta-ness of this pasta. The leftovers are just as good cold as a salad. December 10th – 16th: Monthly Featured Ingredient/Dish Challenge–Cakes! The pasta with those colourful adorable tomatoes looks absolutely yummy! 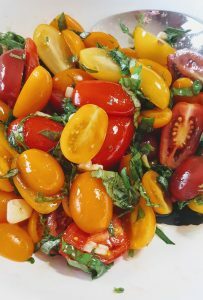 It’s much better in the summer when tomatoes are garden fresh. 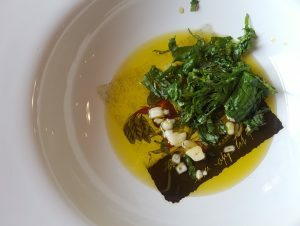 The image of live oil in a large serving bowl with garlic and a handful of basil leaves into it did it for me. Let the flavor meld and comfort us in the process. This pasta dish certainly has all the right ingredients for comfort. Cheese is always the key, isn’t it? 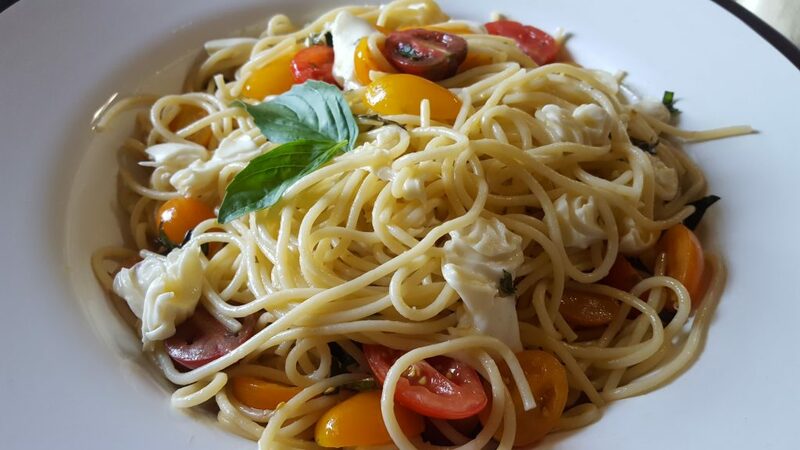 Mmm… pasta and cheese and fresh basil and tomatoes. Looks like the perfect therapy to me. Pasta therapy could become a thing, right? Wow, what a wonderful looking dish! I can never resist pasta, and this is so easy and quick to put together. Really flavorful, too. Thanks! Easy, delicious, comforting and filling. this pasta dish would have been fabulous with some of my homegrown tomatoes. Next year for sure!